Mobile phone users in China, Brazil, India and Russia are driving the global telecoms boom, a report by UK telecoms watchdog Ofcom suggests. Since 2001, these countries have added 660 million new subscribers, accounting for 40% of total new mobile phone accounts globally. Their large populations and economic muscle mean they will continue to grow and likely dictate technical standards. New subscriptions in India alone doubled to 150 million in 2006. The spread of networks into smaller towns, lower voice tariffs and intense competition spurred growth in the Indian market last year, which now has twice as many subscriptions as the UK. With 2.8 billion people, nearly half the world's population, and rising incomes, the four countries - referred to as the BRICs - still have the potential to acquire millions of new phone subscribers. While Russia's mobile phone penetration is 106%, Brazil's is 53%, China's is 34% and India's is just 14%. The absence of old-fashioned land-line infrastructure means that the BRIC countries are introducing new technologies at the same pace as more mature economies, the report said. "Growth in the number of users of communication services within the four countries will continue," the report said. The growth will be "driven both by penetration into lower income segments, through the expansion of coverage and the continuation of falling prices, and also rising economic prosperity in smaller towns and rural areas," it added. The sheer size of the BRIC market makes it likely that it will be key in deciding standards and dominant technologies, it added. Investment capital is pouring in, as firms, tiring of more mature markets, are eager to take advantage of the returns on offer, it added. Most mobile firms in these four countries make their money from voice services. But in the case of China, which enjoys the most developed mobile data market, generating 20% of mobile revenue from data services, consumers have proven eager to stay in touch by text. 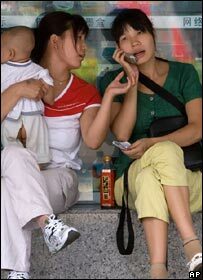 Last year, mobile phone users in China sent 429 billion text messages, or 967 text messages per user. That compares with 621 per mobile user in the UK. China is also unusual in that the number of fixed lines grew by 79%, powered by the roll-out of fixed lines outside the main cities. Digital television remains in its infancy in the four emerging giants. Both Russia and India have seen their television industries grow quite fast, the former driven by an advertising boom, the latter by subscriptions to services such as Star.